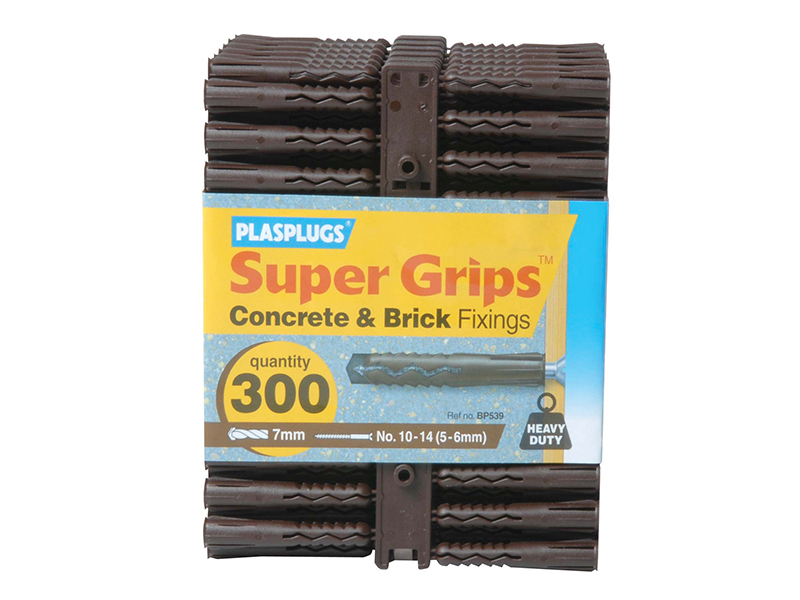 The brown wall plugs are heavy-duty and will accept screws No 8-14 (4.5-7mm). 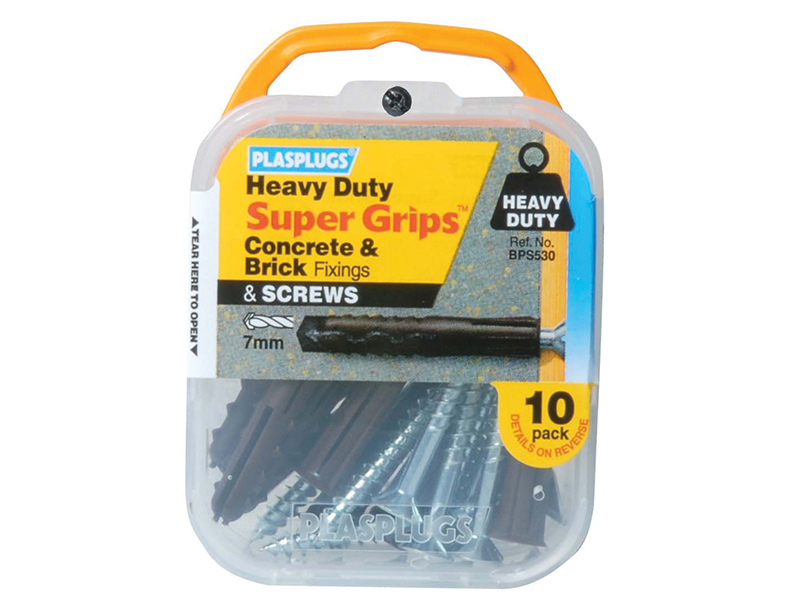 The brown wall plugs are heavy-duty and will accept screws No 8-14 (4.5-7mm). 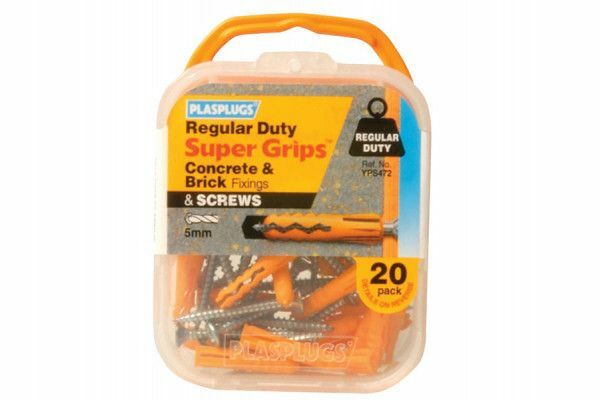 This pack is also supplied with screws. 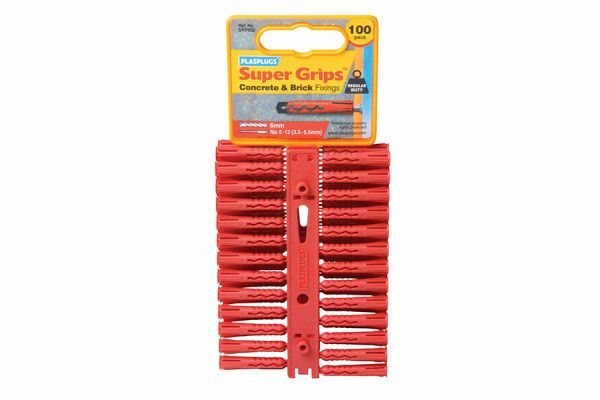 The red wall plugs are regular-duty and will accept screws No 6-12 (3.5-5.5mm). 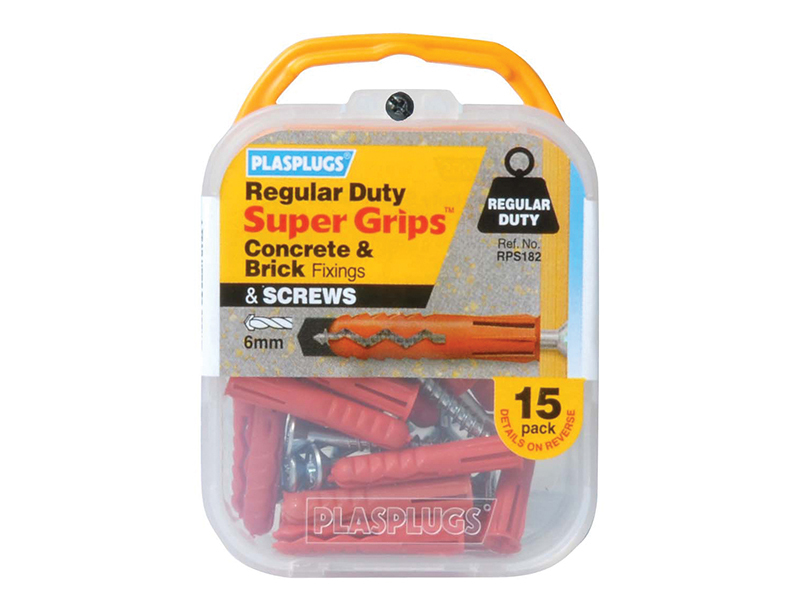 The red wall plugs are regular-duty and will accept screws No 6-12 (3.5-5.5mm). 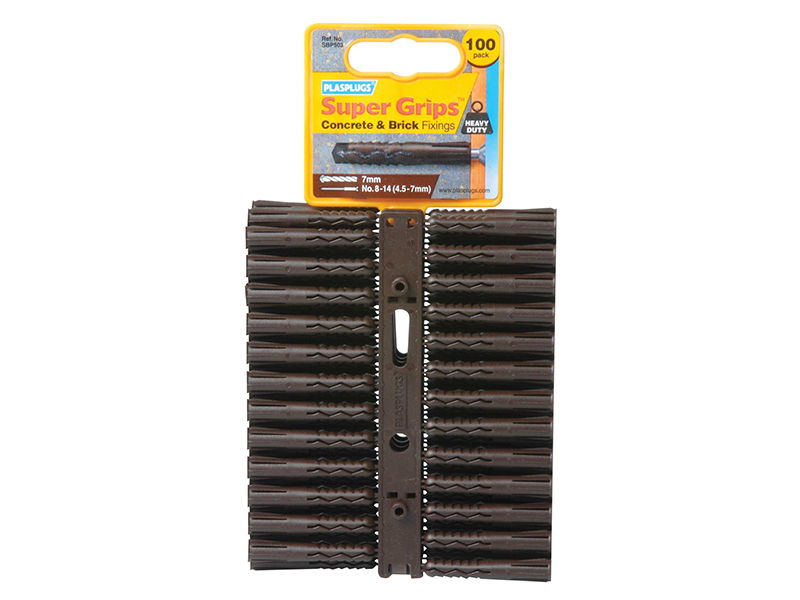 This pack is also supplied with screws. 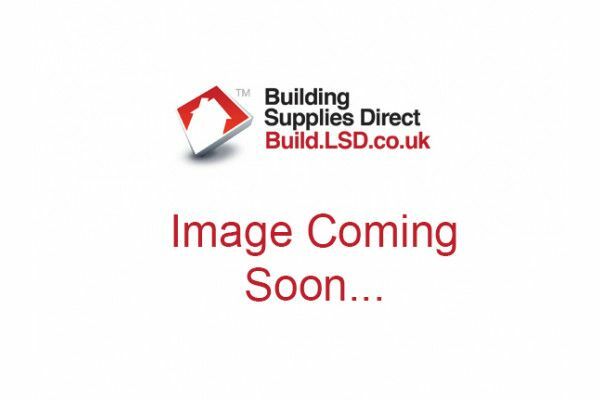 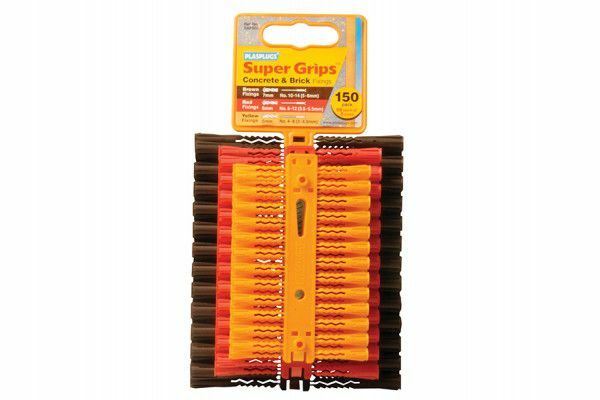 50 x Regular-duty yellow Super Grips™: Accepts screws No 4-8 (3-4.5mm). 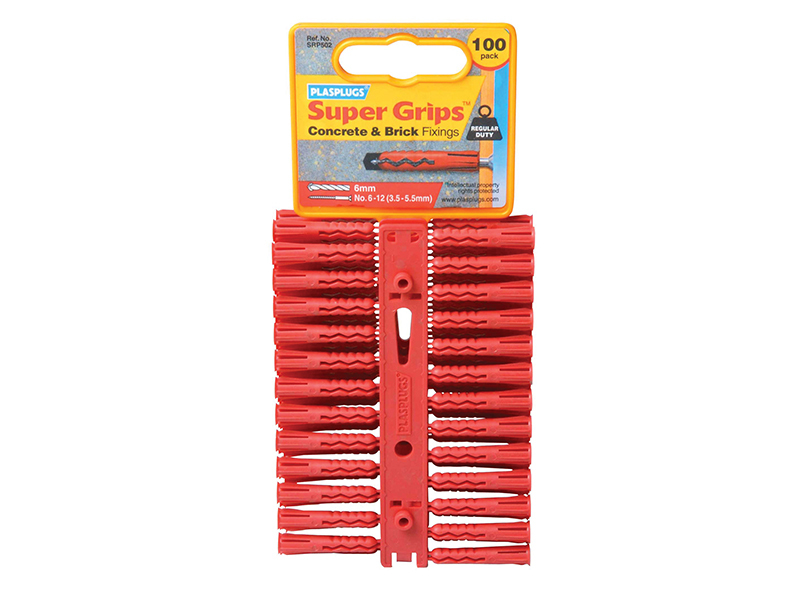 50 x Regular-duty red Super Grips™: Accepts screws No 6-12 (3.5-5.5mm). 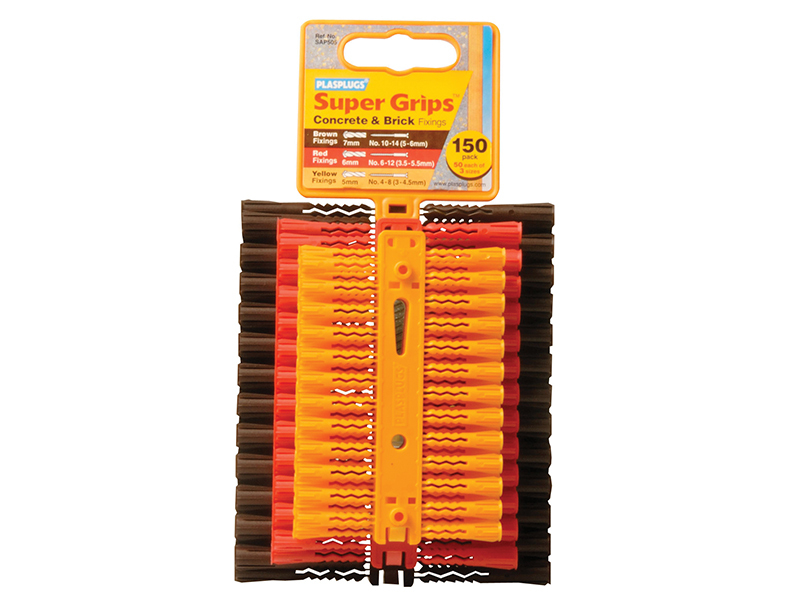 50 x Heavy-duty brown Super Grips™: Accepts screws No 8-14 (4.5-7mm). 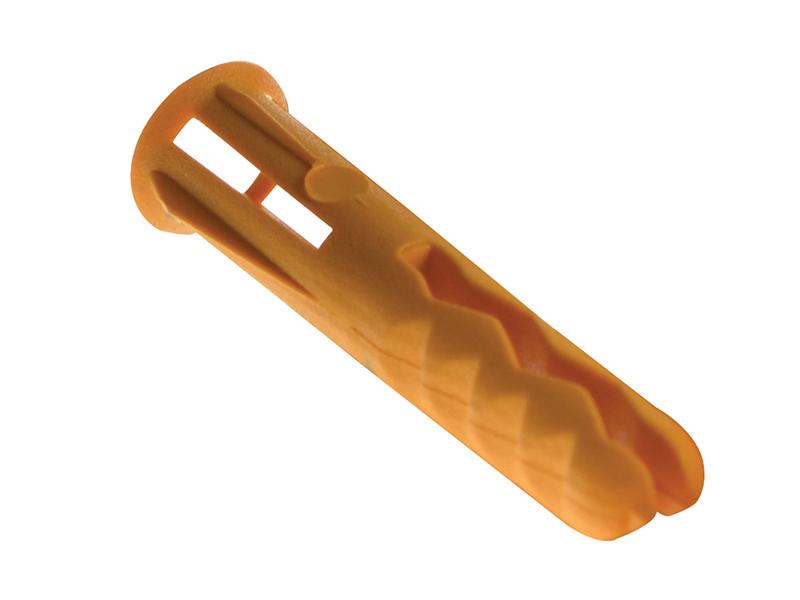 The yellow wall plugs are regular-duty and will accept screws No 4-8 (3-4.5mm). 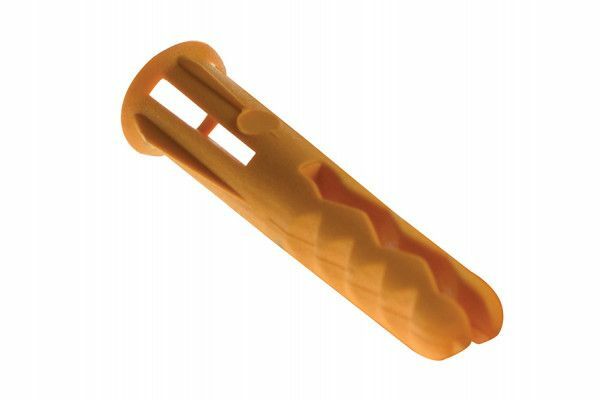 The yellow wall plugs are regular-duty and will accept screws No 4-8 (3-4.5mm). 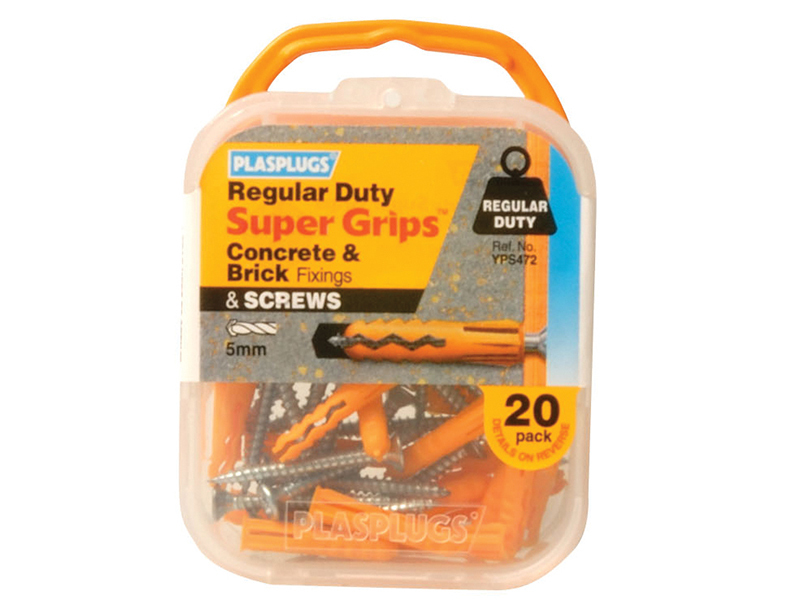 This pack is also supplied with screws. 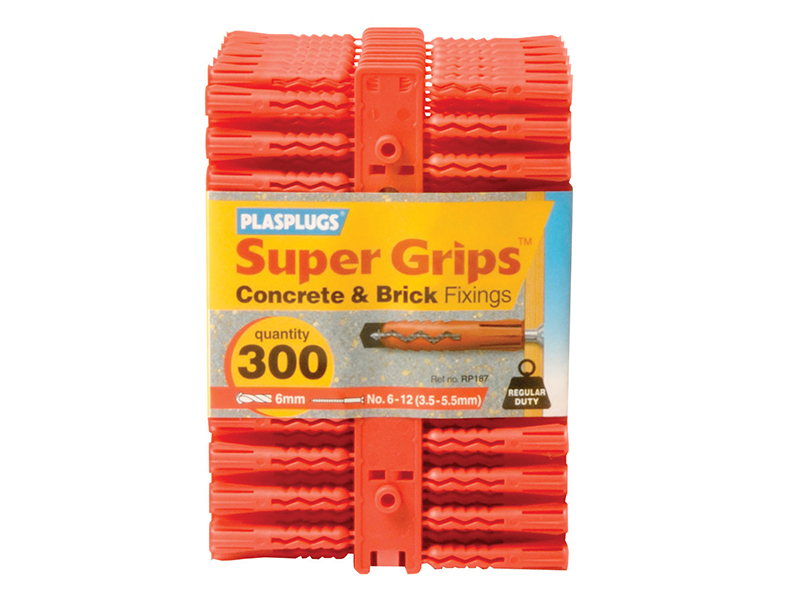 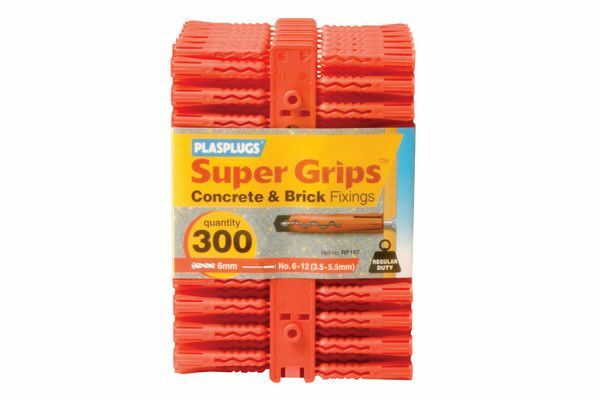 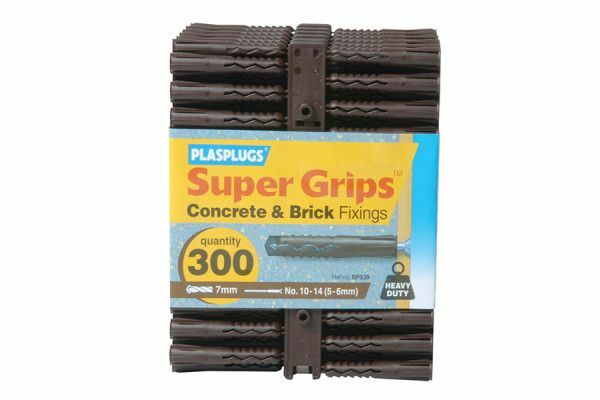 The Plasplugs Super Grips™ wall plugs are suitable for fixing into concrete and brick. 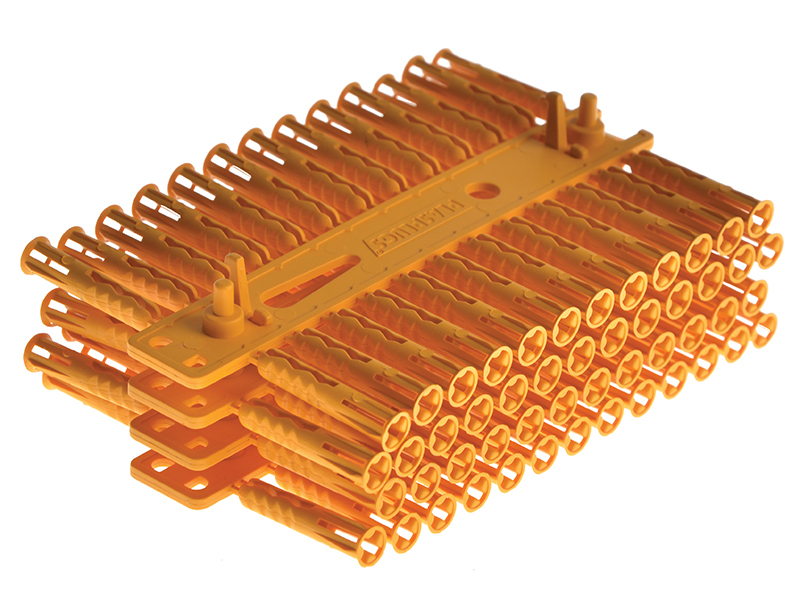 They are available in 3 different sizes/colours. 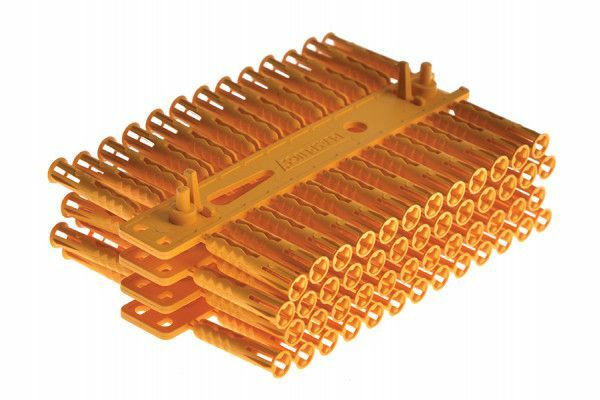 Yellow: Regular-duty, accepts screws No 4-8 (3-4.5mm). 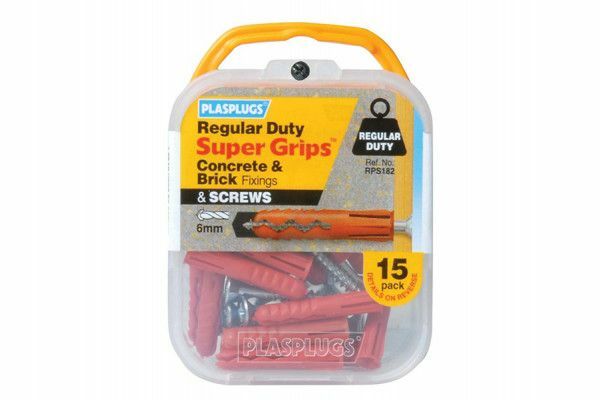 Red: Regular-duty, accepts screws No 6-12 (3.5-5.5mm). 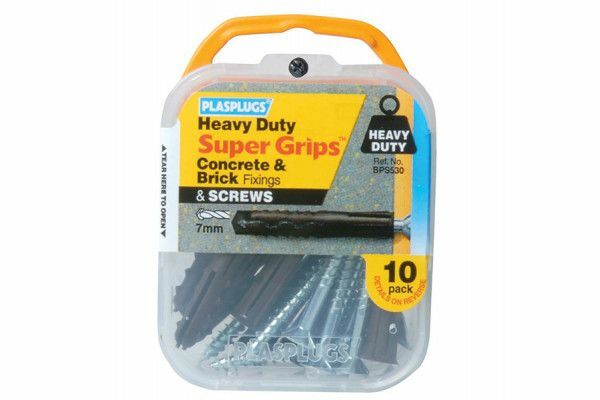 Brown: Heavy-duty, accepts screws No 8-14 (4.5-7mm).